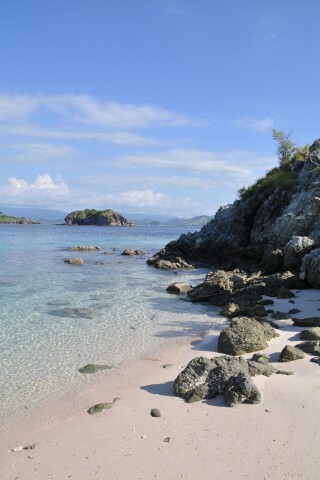 Bididari Island is a popular daytrip destination for those heading out of Labuan Bajo or Wae Cicu and the white sand beach certainly doesn’t disappoint. Browse places to stay in Labuan Bajo on Booking.com. Book Now - Pay Only When You Stay. If you’re visiting on a daytrip, expect to be dropped on a sandy stretch on the northeast coast of the island. The reef is right offshore and has a good drop off. This spot was particularly notable for the volume of fish and we also saw a seasnake here which was quiet a surprise. The beach is very attractive and is fairly well looked after, though did have a fair amount of high tide trash. The snorkelling at Kanawa or Seraya is better than here, in part because there are a lot of boats coming and going dropping people off for a few hours of snorkelling -- they anchor right on the beach unfortunately. The beach has limited shade, but as long as it isn’t too busy you’ll find some shelter. As with the other islands, pack plenty of sunscreen and water. There is a upper-range resort on the far side of the island, Angel Island Resort but daytrippers are not permitted to stop there nor seemingly set foot on their beach -- when we tried to walk through the brush to have a look at the resort and were told in no uncertain terms not to proceed. If you’re looking to stay here, rates start at around 100 euros per night -- contact them via their office in Labuan Bajo at Reefseekers (on the main road through town). Because this is quite a hike from Kanawa or Seraya, you’re more likely to visit here from Labuan Bajo or Wae Cicu -- both are about 30 minutes away by boat. Browse our independent reviews of places to stay in and around Labuan Bajo. Read up on where to eat on Labuan Bajo. Check out our listings of things to do in and around Labuan Bajo. Read up on how to get to Labuan Bajo. Planning on riding a scooter in Labuan Bajo? Please read this. See below for more sights and activities in Labuan Bajo that are listed on Travelfish.org.